Learn Like A Mom! What is a Blog? - Learn Like A Mom! I’ve often been asked, “What is a blog?” This is my attempt to answer that question in a simple way. The word blog is short for web log and although the quick answer for me would be “a web journal” or “online diary,” I think blogs encompass more than that. Blogs are platforms for people to write about pretty much anything and everything. I was first introduced to the concept when a few friends starting writing family blogs as a way to keep in touch with distant friends and relatives or keep up with documenting their lives for themselves or their children. Sort of like a modern day scrapbook or baby book. Then, I followed a couple friends as they blogged about traveling around America. One’s purpose was to find a small town to settle in and the other’s purpose was to kill time while unemployed and waiting for a call to serve as a minister. Now I follow all sorts of blogs. There are blogs about dogs, traveling, kids, cooking, religion, fitness, politics, crafts, parenting, writing, educating, interior design, you name it! There are even blogs about blogging! Individuals run blogs. Groups of friends run blogs. Businesses run blogs. Religious institutions run blogs. Blogs are a way for people to connect over certain topics and interests, socializing in the ever-growing blogosphere. Chances are, you’ve read blog posts without even realizing it. Most look like an article you’d find on any website. 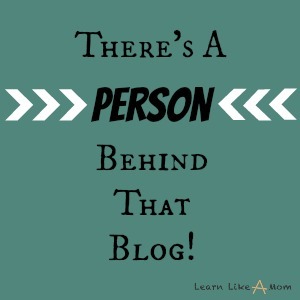 But blog posts typically have a personal touch. They’re a wonderful way for people to share tips, tricks, tutorials, inspiration, and more with others. If you want a more thorough definition of the term blog, this one is from Wikipedia. Blogs are also a way for businesses to advertise through honest reviews and giveaways. They partner up with bloggers to spread the word about their products or services. So, some bloggers are also advertisers. A blogger is someone who writes a blog, plain and simple. But bloggers are also people of almost any age, race, ethnicity, or gender. They come from places far and wide with an array of backgrounds creating an endless supply of experiences, thoughts and conclusions that offer plenty of subject matter to blog about. To say they are just bloggers feels like an injustice. Bloggers have lives…in real life. Bloggers juggle social networking, writing, and posting with daily life, and oftentimes with other careers and responsibilities. One of the most memorable blogs I followed was my friend Kim’s. She kept it while she fought cancer with her entire being, documenting rays of hope and stumbling blocks along the way, glittered with pictures of her young and beautiful family. She connected with thousands upon thousands of people around the globe before passing away at a young age. To say she was just a blogger would be wrong. To say any of us are just bloggers would be inaccurate. Bloggers could be the people sitting at your dinner table, standing next to you in the check-out line, or that group of parents that get to take their families to movie premieres, resorts, aquariums, and theme parks just to blog about it later! Look in the mirror. That person could be a blogger!